7 Kids and Us: Monstober Fun and Giveaway from Razor! Halloween is almost here and to celebrate Razor is launching Monstertober for the month of October on the new Razor Jr. YouTube channel. Monstertober will mean the channel will be filled with Zombie and Monster fun – to keep kids laughing and parents engaged! One of the videos created especially for Halloween provides great makeup tips for anyone to become a Zombie or Monster themselves -- easily and inexpensively. This year, my boys will be riding their Zombie Kix and Monster Kix while trick or treating! 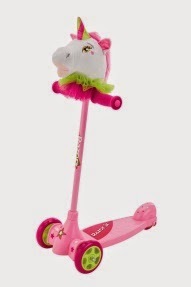 I love that this is not just a cool scooter but also a fun accessory to their costumes. Riley is going to be a Zombie and Xander is going to be Frankenstein! I think they are going to be a HIT. With the awesome video tutorial above, I can make sure and get the makeup just right too. The girls will definitely be riding their Razor Jr. Kuties Cowboy and Princess scooters! I like that the Cowboy can be for boys or girls...we are dressing up one as a cowgirl..how cute is she going to be? The other is going to be Elsa, and will look fabulous on her Unicorn. Razor was nice enough to offer TWO of these scooters as a giveaway! The first winner can choose between the Kix or the Kuties, and the second winner will get the other one. Dont forget to check out the NEW Razor Jr. You Tube Channel here for all kinds of fun videos! Sidewalk dwellers beware - kid Zombies and Monsters are ready to cruise! Preschool kids love to role play and they're always on the move, so now they can do both. 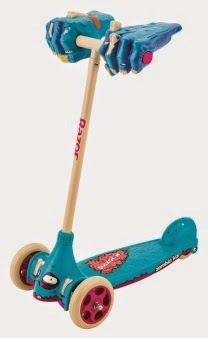 The new Razor Jr. preschool scooters with popular zombie and monster themes are great for some silly scootering fun! 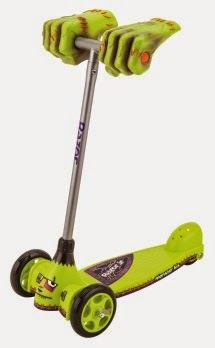 The Zombie and Monster Kix scooters have over-sized, soft-molded handlebar grips that look like creature hands with matching deck graphics. The stand-alone design helps young riders build coordination and the tilt-to-turn feature helps them learn to steer. The Kuties are the perfect preschool scooters with a two-in-one surprise – it's a scooter and a hobby horse. Now kids can take a ride with a cuddly buddy! 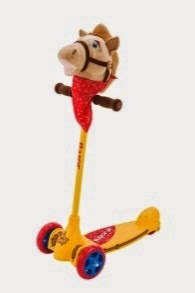 The stable three-wheel design features an extra-wide deck to build coordination and the plush horse and unicorn character heads lift out of the scooter to become a hobby horse for extra, active, outdoor fun! Cowboy and Unicorn designs include plush heads with decorative embroidery and theme deck graphics. Enter using the rafflecopter form below..and good luck!